Susan Woodall is currently studying for a PhD at Royal Holloway, University of London. She is researching the relationship between the material setting and the reform methodology of institutions for ‘fallen’ women in nineteenth-century England. Her particular interest is in the interaction between the material culture of the locus of reform and the reform process experienced by the inmates. Both Thomas and his wife Emma Pumphrey served on committees associated with the Brandling Place Home for ‘fallen women’, established in Newcastle in 1861. Around 58 such institutions were already functioning by 1860 across England, Scotland and Ireland. [iii] From the late 1870s, Emma was active on the Ladies’ Committee, attending monthly meetings at the Home premises and visiting regularly in between. 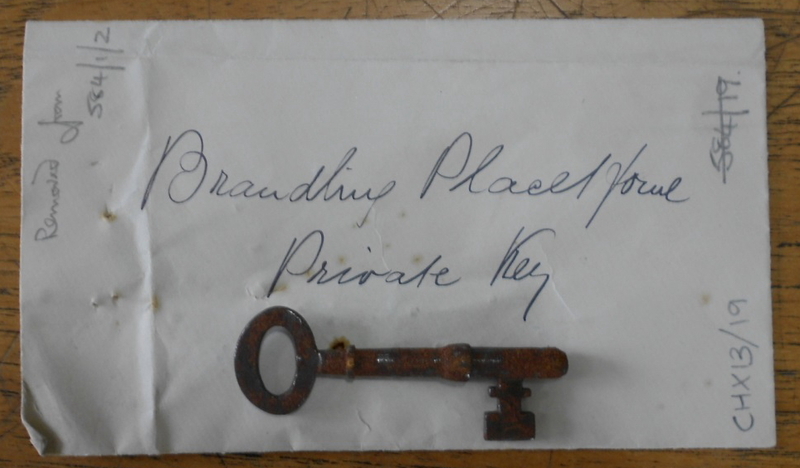 Given the nature of the Home, and assuming that the envelope belonged to the Pumphreys, we can make a reasonable case that this key would have belonged to Emma. Typically aged between 16 and 25, they were young women mostly from ‘the labouring classes’, who had had some form of sexual experience outside marriage. Whether working as prostitutes by choice or through economic necessity, ‘seduced’ or subjected to other sexual exploitation, they were judged by the attitudes of the time to have lost moral and social respectability. How did women get into institutions like the Brandling Place Home? Sometimes they were sent by a magistrate as an alternative to prison or brought (more or less willingly), by a street missionary into ‘safety’. Sometimes accompanied by a friend or family member or simply presenting themselves alone, whatever their route, women arrived at the doors of these institutions often anxious, frightened, resentful, desperate or relieved. Although often prison-like in discipline, with residents referred to as ‘inmates’, these institutions were not technically prisons. Women could leave by negotiation, but attempts would be made to dissuade them, as in most institutions re-entry was not usually possible. Some women succeeded in talking their way out, some just co-operated and kept their heads down. Others could not wait and incidents of running away were common. Locks were the chief means of keeping inmates in: keys that could let them out were therefore powerful objects and needed careful stewardship. At the Brandling Place Home, the Ladies’ Committee operated a system of Superintendents: senior inmates who could be trusted to keep the key of the gate into the Home premises in the Matron’s absence. This time the inmates used the key not to get out, but to let male visitors in. ‘a young man met me as I was going from Paxton to St Neots – forced me into a field – I struggled with him & shrieked but no one came to my aid’. What had happened to W from the time she left the Refuge for her sister’s is unclear, but her distress suggests that life outside was hard. Despite her difficulties in the Refuge, she regretted not being inside. W’s case reminds us of that women experienced these Homes differently. Today, the very idea of these institutions is inexcusable, made worse by the exclusive focus on reforming female and not male moral behaviour. It’s worth considering though that at a time when the only form of statutory welfare support was the workhouse, at the very least these institutions provided women with board and lodging and some form of preparation for work in domestic service. As a material survival from one of these lost institutions, Mrs Pumphrey’s key is rare, and my own excitement at opening the envelope and handling this very ordinary object was doubtless baffling to the patient archivist who fetched it for me. Initially unpromising, our emotional response to this object relies on understanding the purpose of the institution it secured and the different experiences of the women it confined. For W, demanding though life in the Cambridge Refuge was, it gave her a few months’ respite and the companionship of other women. For T, the key she took meant well-deserved freedom after a long two years and the chance to regain control over her own life. [i] John Styles, Keynote: ‘Objects and Emotions: The London Foundling Hospital Tokens, 1741-1760’, Emotional Objects: Touching Emotions, Conference , Institute of Historical Research, 11 November, 2013. I am very grateful to Tyne and Wear Archives and Cambridgeshire Archives for permission to use the image. What a fascinating angle of discussion, thank you Ms. Woodall for this clear and elucidating post. The Quakers were not the only group, but they were one of the most respected, to establish refuges for fallen women. I would argue that such institutions have much to reveal about Victorian men’s attitudes and double standards: especially that they subscribed money to such institutions to assuage their consciences, as Charles Dickens, Wilkie Collins, and many others did, men who never felt it necessary to explain why they abandoned their wives and families for the ‘other’ women. They did very little to challenge widespread condemnation not just of fallen women but also women who were persecuted for the same ‘crime’ (read Lady Worsley’s Whim and Mrs Robinson’s Disgrace for two accounts). Orphan Foundlings were born to live unhappy lives unaware of their origins, as Quaker, Robert Barclay observed. Each of their identifiers, or tokens, tell a tragic story. all were renamed to conceal those origins.